I email my newsletter every Wednesday. Sign up to keep informed on state and local issues by entering your email address in the box below and click "GO." See previous issues of the newsletter. Thank you for making a donation to my campaign. ©2019 Authorized by Kenneth R. Plum. 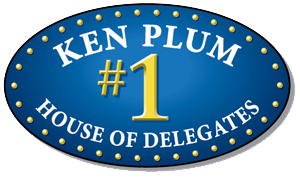 Paid for by Friends of Delegate Ken Plum.